^ See, eg, Rwanda: How the genocide happened , BBC, April 1, 2004, which gives an estimate of 800,000, and OAU sets inquiry into Rwanda genocide 互联网档案馆的存檔，存档日期2007-02-25. , Africa Recovery, Vol. 12 1#1 (August 1998), p. 4, which estimates the number at between 500,000 and 1,000,000. 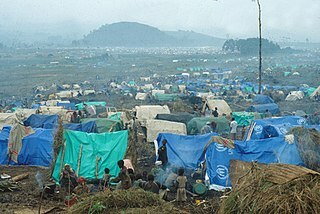 Seven out of every 10 Tutsis were killed. ^ 人民網. 索馬里巷戰越戰後美軍最為慘重的軍事失敗. 新浪網. 2004年2月10日 [2008年12月21日] （中文）. ^ BBC. 法國解密盧旺達大屠殺機密文件. BBC中文網. 2006年11月2日 [2008年12月21日] （中文）. Human Rights Watch "Leave None to Tell the Story"
BBC News Panorama - When Good Men Do Nothing Article about the genocide by BBC Panorama reporter Steve Bradshaw. BBC Witness: Stench of Blood A personal account of the events. Leave None To Tell The Story: Genocide In Rwanda. Online publication by Human Rights Watch. Mar. 1999. ISBN 1-56432-171-1.